Below is a list of past, present and future events. Normally, Mockingbird Station is a bustling, quick paced area in Dallas. But on Saturday, May 4th, it will be a yoga sanctuary where we will center ourselves and find inner peace! Our veteran yoga instructor, Virginia Altick, from CorePower Yoga will take you through an all levels foundational vinyasa yoga flow. The first 25 ticket holders will also get a Mockingbird Station branded water bottle from S’well! Spin & Flow will be a 2 hour affair! We have three sessions for you, our attendees, to choose from! Each session starts at a different time and consists of both a 30min yoga session as well as a 30min cycling session! Cycling will be led by Meg Ellis, Laura Berton, Chris Foley, and Katie Anderson. After your session is finished, we will have complimentary vendors, merchandise and restorative therapies - depending on your ticket type! General Admission (GA) ticket grants you entry to the event, access to an unlimited amount of Topo Chico, a limited amount of local vendors and a protein bar from Fitjoy . The VIP ticket has everything the GA ticket has plus a massage, cryotheraphy treatments, Sweatii tank top, Fitaid recovery drink, and access to a Keg from Holler Brewing! The "No Sweat" ticket option gives you everything the GA Ticket includes except the workout! And the "No Sweat" VIP ticket has everything the VIP ticket includes except the workout! Part of the proceeds go towards funding BARC Houston, whose mission is to promote and protect public health and animal care through sheltering, placement programs, and animal law enforcement. We will meet at our indoor venue for a Vinyasa Yoga Flow taught by Brit Jager and mindful meditation led by Jenni Finley. On July 21st we had a TWO part Yoga and Cycling event at CYCLEBAR- Sawyer Heights! The event consisted of a 45 minute Indoor music-powered cycling session led by Laura Berton and Meg Ellis from Cyclebar. The ride was complimented by an outdoor gentle flow led by Eliza Ogasawara and Jamie Lim from BIG Power Yoga. Part of the proceeds from this event went towards Pup Squad Animal Rescue's efforts at protecting litters of puppies and their mothers from euthanasia and diseases from animal shelters! Our friends from SWAY Water provided us with fruit infused water, High Brew Coffee saw to our caffeine fix and CYCLEBAR provided small, nutritious bites. All event attendees received discounts from Athleta and Cyclebar. Some of our attendees also won FREE sessions from Cyclebar Sawyer Heights, Real Results fitness, and shop cards from Athleta. On May 12th, Sweatii partnered with SEARCH Homeless Services to benefit the House of Tiny Treasures who provide early childhood education to children whose parents are homeless or living in deep poverty. Our rejuvenating 45 minute yoga flow's ambiance was created by sound-healing singing bowls. After yoga, our guests mingled with other attendees, they also got a personal tour of the House of Tiny Treasures and enjoyed the on-site health-conscious vendors like Juiceland, Pat Greer's Kitchen, and Sway Water! Some of our participants won raffle prizes from Juiceland, Bangs Shoes, SoulFitGrill, Beyoga, and many more local companies. Bend and Brunch is our first event of the year and we will be partnering with Red Mango to give back to the Houston Food Bank! The event will consist of a 45 minute yoga flow thought by Jnae Williamson from Yoga pod West Houston, flavored waters provided by Sway water, Table stretches by The Stretch Factor, and food samples from SoulFitGrill. At the event, we raffled off 4 Lululemon mats, discounts from Athleta and Yoga Club and a 75 minute Nutrition Consult from a Certified Holistic Health Consultant. 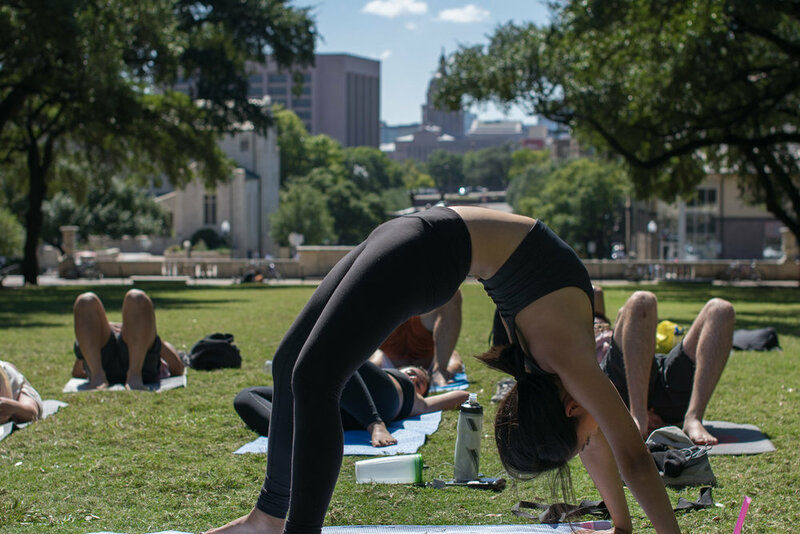 We teamed up with a T4K rider to put on a donation based yoga event at the University of Texas at Austin on Sunday, October 22nd at 12pm. T4K or Texas 4000 is an organization at the University of Texas at Austin that rides from Austin, Texas all the way to Anchorage, ALASKA!!! They spread awareness about Cancer in several cities starting from the moment they leave Austin until they reach Alaska.